Sometimes, a dog’s own curiosity to raid the trash can may be his very first introduction to human food. Dogs often raid trash cans because they smell food inside that they’ve tasted before — maybe it was given to them by their owner, or maybe they discovered it on their own while raiding the trash before. The point is: once your dog has tasted human food, his curiosity is piqued and he will continue to want more of those same foods — especially when he catches even the slightest whiff of their aroma. To prevent this type of behavior in your dog, your best bet is to keep human foods away from your dog at all costs. Many dog owners freely share human food scraps with their dogs. However we have given our dog a handful of human foods — at times when he’s been on meds and needed “enticement” to take a pill. And from personal experience I can tell you that any time we’re eating one of those 5 foods ourselves, our dog suddenly becomes incredibly interested in what we’re eating. Why? Because it smells familiar to him. So, the #1 downside to introducing your dog to human foods (even for “medical” reasons) is this: once your dog has tried it, they always want it. 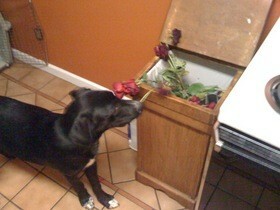 And some dogs will do anything to get it, including raiding the trash! In our case, we have diligently tried to associate those 5 human foods that our dog has tasted specifically with his doggie meds. They are given to him only at times when he is ill or needs to take doggie medications. Otherwise, if we give in and let him have those same human foods at other times, then he will most likely increase his “curiosity” for those foods and start begging whenever he sees someone eating them. And worst case scenario: he might actually start poking around the garbage for the source of those smells that he’s associated good tastes with. So far, we’ve been lucky. Our dog seems to know which food is his, and which is ours. And he never once had begged for food when we’re eating. If at all possible, it’s important to start the “no table scraps rule” when your dog is a puppy. Because after you do it just once, it then becomes tempting for you to share “just a little” with your dog on other occasions as well. 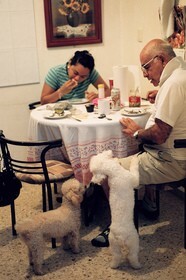 Some dog owners actually share table scraps with their pets routinely. Just keep in mind, after you do it the first time, then your dog will have already formed an interest in that type of food, and you’re likely to have some food issues you’ll have to work on with your dog (begging, raiding the trash). So if you want to keep your dog away from the begging and out of the trash can, it would help tremendously if you prevented your dog from ever tasting food items like those typically left inside trash cans. Chances are, if you’ve never introduced human foods to your dog in the first place, then he will be likely to want to raid the trash can when you’re not looking. Of course, if your dog already has that yearning for human food, then one way he is probably displaying that is by raiding the trash can. In which case, it’s time to try some dog-friendly deterrents to keep your dog out of the garbage. In addition to the many ideas for keeping your dog out of the trash & best dog-proof trash cans found here, another tactic that might work is to make a conscious effort to not put anything in the trash can that could potentially harm your dog. Put harmful food items down the garbage disposal instead of in the trash can. Put any dangerous items into used food containers (such as empty spaghetti sauce jars and disposable plastic bowls like margarine containers). That way, if your dog does get into the trash, he can’t access the dangerous item. Let’s be honest, we are all likely to forget at times. And sometimes it’s hard to get all family members to go along with a new house rule like this. Wondering which foods are physically dangerous for dogs to ingest? Here’s a list of human foods that are safe, as well as those that are harmful to dogs. Plus, keeping just the harmful things out of the trash can doesn’t prevent the rest of the garbage from being strewn all over the floor and throughout the house — if that’s what your dog enjoys doing. Some dogs raid the trash can simply out of boredom. Whether they find food or not is not always their measure of success. If that describes your dog, then one of the other methods should be used instead like dog-proof trash cans.